Our nice winning run ended last week, although we came very close. The 40/1 Ryan Palmer had a solid showing at the Valero Texas Open but ended up in 6th place. 1 more stroke and he would have cashed. As it is after a poor 1st round he got going but he opened up the final round poor. He got better as time went on but still just couldn’t make it for us. This week the PGA has a tricky one to handicap in the Zurich Classic of New Orleans. The European Tour has the Volvo China Open. Course form isn’t really a factor for this one as you can only factor in last years. It’s interesting though because Levy, who got 1st and 3rd in 2014/2015, could only get 28th last year. I much prefer having course form to go on. It’s good knowing how they can handle a particular course etc rather than having to speculate. However that one tournament does help. I’ll just be sticking to quarter unit bets though. All of them are to win and E/W. David Lipsky: The American performed well here last year coming in tied for 9th. He was 6 strokes off the lead but Li Haotong was really in the zone last year with a stellar 64 last round. Lipsky is coming in hot off that 5th place at the Shenzhen International. It could have been much more as he had a weak first round as well. I’ll be backing him to keep that momentum going. Peter Hanson: Hanson had a very solid outing last year here where he went 66-71-67-67. That sort of consistency is great to see. The bookies only have him at 40/1 too so I think they’re aware of his abilities here. I feel he’s coming in on decent form and will back him. Those are my only two bets in the Volvo China Open. 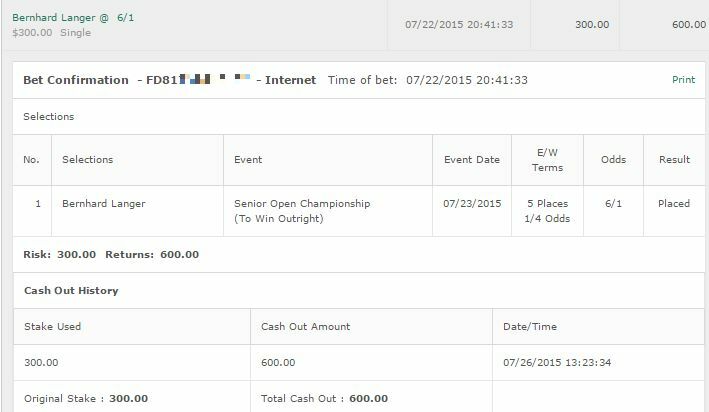 After looking into it I don’t have any serious bets for the Zurich Classic of New Orleans. I’m going to opt not to bet that one. 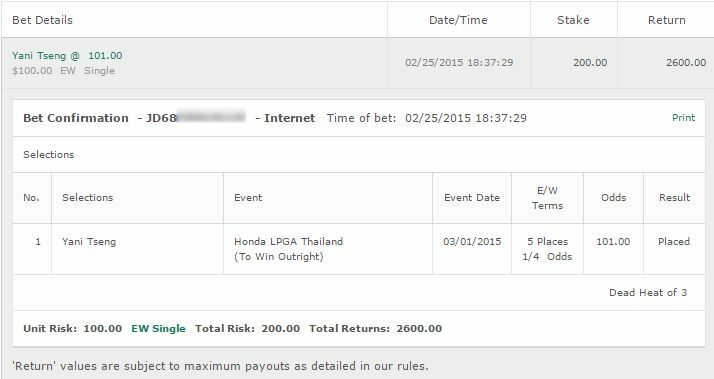 I’m taking Lexi Thompson to win for half a unit. Look I’ll be honest I haven’t even looked at her form, or how this course will suit her style etc. It’s very simple – after what happened at the ANA Inspiration I decided to blindly back her in the next tournament she participated in. Here it is – and here I am backing her. 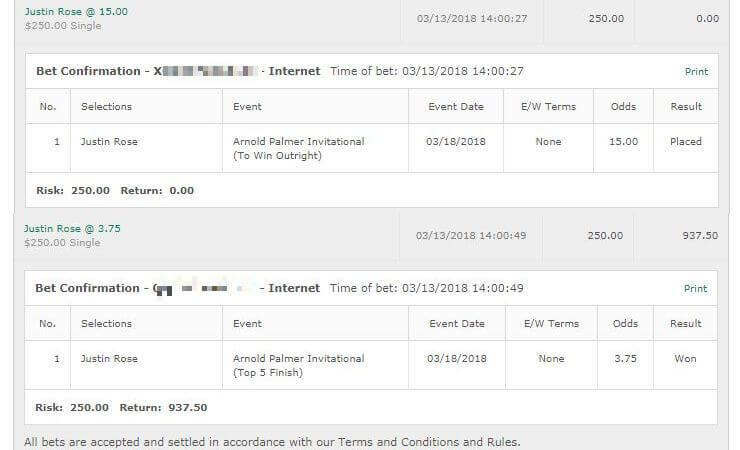 I’m not saying it’s a good bet or anything – hell Inbee Park dominates at this course and is 7/1 so I don’t think we’re getting great odds on Lexi. If anything a lot of people are betting her purely because of this. Finally for another half unit I’m on Cristie Kerr. Performed well here in the past and coming in off a graet LOTTE Championship performance. That one she’s 25/1 so E/W is fine.